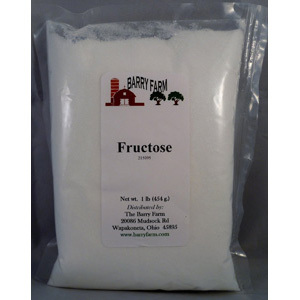 Fructose is a simple sugar often times found in plants and hence also called fruit sugar. It occurs naturally in honey, fruit, root vegetables, and flowers and is typically produced from beets, sugar cane, and corn. It is one of three sugars (the others being glucose and galactose) that the body can digest directly into the bloodstream. In its pure form it closely resembles sucrose (table sugar), but is about 1.7x sweeter per volume and is more water soluble. Hence it is often used in sweet foods and beverages to enhance the sweetness with less volume (as in these carbonated cranberries). 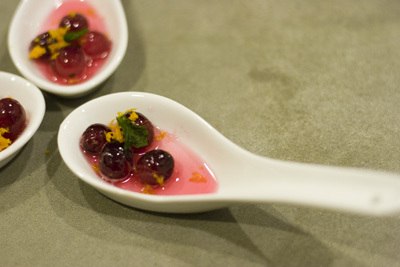 In modernist cooking, fructose is often used for very sweet preparations to cut back on the volume and calories needed. It is perfectly fine to substitute fructose for sucrose or vice versa using 50% less fructose than sucrose. Find a reliable source here.